The most atmospheric game at E3 had to be thatgamecompany's Journey. Following Flow and Flower, thatgamecompany's third Playstation Network-exclusive downloadable title is called Journey. Sony put this emotionally-focused title into our hands at E3 and gave us an idea of what it's all about. Journey is being designed as a somewhat intuitive and instinctive title to play. There's won't necessarily be a heavy amount of instruction guiding you through, and you hopefully won't need it. I was dropped into a massive desert, climbing up hills of sand and gracefully gliding downward. I wasn't sure exactly what to do at first, but when I saw a giant, flapping piece of cloth I knew I was supposed to go check it out. 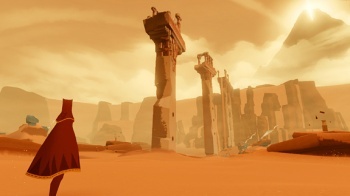 Journey focuses on cloth, with the player wearing a red cloak and a scarf. Certain points in the game feature floating plumes of cloth that you collect into your scarf to help you fly. The objective of the level I played was to find certain points of these larger, flapping cloths attached to a piece of ruin to "use" them which formed cloth pieces of a larger bridge connecting stone pylons that led to the next level. Meanwhile, thatgamecompany showed me Journey's multiplayer, which is more of an emotional experience than what you'd traditionally think of as multiplayer. Another red cloak-wearing hero entered the world, emitting a strange sound with a glyph above his/her head. The hero flitted about the world just like me, neither of us really guiding the other, but I felt the desire to stay near so we could take on the world's challenges together. You have no way to communicate with this person, or even know whether they're a man, woman, or child. Your powers can be somewhat improved by having another player around, but mostly they're just there for emotional support. Players will randomly appear, and if you get too far away they'll disappear. Journey feels like a larger effort compared to what we've seen before from thatgamecompany, with what looked like a massive (and beautiful) world to wander around. Players have to figure out what happened to wreck the world, but are told visually rather than through words. I only got a brief hands-on with the title but already felt an emotional investment in the strange land I explored. Journey is expected in 2011 on the PlayStation Network.